Home » Health » What Is Transient Ischaemic Attacks? What Is Transient Ischaemic Attacks? Transient Ischemic Attack ( TIA ) or mild stroke is an attack that occurs when blood supply to the brain is interrupted for a moment. This attack generally lasts shorter than stroke, ie for several minutes to several hours, and the patient will recover within a day. Although only a moment, TIA is a warning of a more severe attack. Having experienced TIA means you have a higher risk for stroke and heart attack. If not handled properly, it is estimated that there are about 20 percent of people with TIA who will have a stroke the following year. While people with TIA who have the potential of heart attack in the same year is about 30 percent. One side of the mouth and face of the patient looks down. The arms or legs that are paralyzed or become weak so that can not be lifted which is then followed by paralysis on one side of the body. Difficulty understanding the words of others. Loss of balance or body coordination. Do not underestimate the symptoms of TIA even though these symptoms can disappear by itself. This attack indicates that you are at risk of having a stroke at a later stage. Immediately to the hospital if you experience or see other people showing TIA symptoms. People who have had a mild stroke, but have not checked out are also advised to immediately undergo examination at the hospital. TIA is generally caused by the presence of small clumps that are caught in the blood vessels of the brain. These clumps can be either fat or air bubbles. The blockage will block blood flow and trigger oxygen deprivation in certain parts of the brain. This is what causes brain function disruption. 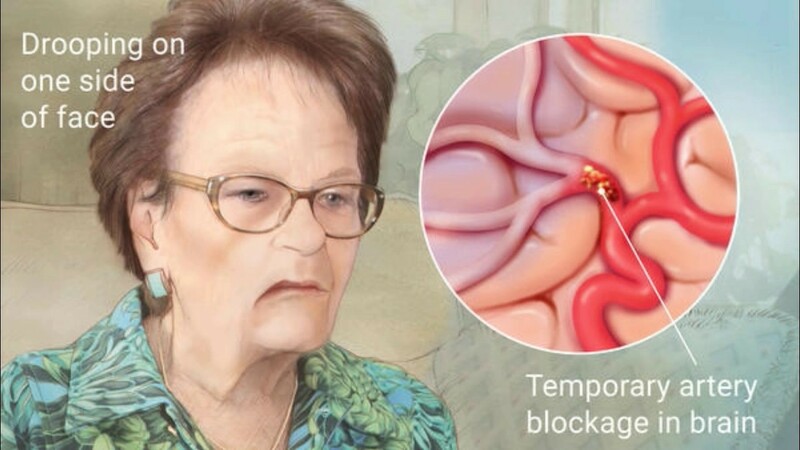 Unlike the stroke, clots cause TIA will be destroyed by itself so that the brain function will return to normal. Therefore, TIA does not cause permanent damage. Age . TIA risk will increase with age, especially for elderly people over 55 years old. Gender . Men's risk for experiencing TIA is higher than women. Hereditary factors . If any member of your family has ever had a TIA, you have a higher risk of getting the same attack. Bad lifestyle. For example smoking, consuming excessive liquor, lack of exercise, eating salty and fatty foods, and using illegal drugs. Unprotected lifestyles can also trigger factors to the risk of hypertension , obesity , and high cholesterol. Influence of certain diseases or disorders . TIA risk in people with heart disorders, heart failure , heart infection, abnormal heartbeat, and diabetes will be higher than normal people. A person who has had TIA is also at high risk for the same symptoms. TIA examination and diagnosis should be done as early as possible. This process will help doctors to lower your risk for more severe attacks later in life. The duration of TIA attacks tends to be short so that generally new people get underwent examination after symptoms subsided. Your doctor will ask you for the symptoms and duration of the attack you have experienced before. You will also have a physical exam, such as blood pressure checks. Neurological examination , such as coordination ability, strength and body response. Blood test . This test allows the doctor to examine the risk factors behind TIA, such as cholesterol and blood sugar levels. Electrocardiogram (ECG) examination . This test can detect abnormal heart rhythms that become one of the risk factors of TIA. Carotid ultrasound . This type of ultrasound is used to check for the presence or absence of constriction or blockage of the carotid artery at the neck. MRI and CT scan . This step is taken if the location of TIA in the brain is not known. Arteriography . Tests are performed to check the condition of the blood vessels in the body, usually through the groin. These types of checks are also useful to discover the underlying causes of your TIA attacks, as well as examine your stroke risk level. Each TIA sufferer will need different types of treatment. The doctor will determine appropriate treatment steps based on several factors, including age, health condition, and cause of TIA. TIA treatment aims to treat or improve the abnormality and prevent the risk of stroke. This step is done through medication and surgery. Drugs are used to prevent the risk of stroke. The location, cause, severity, and type of TIA experienced will be the deciding factor in choosing the type of drug. Here are some types of drugs commonly given by doctors. - Antiplatelet and anticoagulants. Both of these drugs work to prevent clots and blood clots. Aspirin, clopidogrel , and dipyridamole are examples of antiplatelets. While anticoagulant drugs include warfarin, dabigatran, and heparin. - Antihypertensive. As the name implies, this drug is used to treat hypertension. Examples include beta-blockers , angiotensin-converting enzyme inhibitors , thiazide diuretics, and calcium channel blockers . - Statins. The benefits of statins are to lower cholesterol levels in the body. Some types of statins that doctors often give are simvastatin , rosuvastatin , and atorvastatin. In certain cases, surgery is sometimes required by the patient. This step is done when there is a narrowing or clumping the middle to severe level in the carotid artery. The type of procedure that may be recommended is carotid endarterectomy to open open artery blockage and angioplasty to install a sten or balloon as an opening of the artery. In addition to drugs and surgery, lifestyle changes will also play an important role in the treatment process. This can reduce the risk of stroke and heart attack for people with TIA, while preventing TIA attacks again. Diligent exercise . You are encouraged to do physical activity that is quite draining, at least 2.5 hours a week. Stop smoking and reduce alcohol consumption . Both of these measures will not only reduce the risk of TIA and stroke, but also other diseases. Maintain a healthy weight . This move will keep you from the obesity that triggers TIA. Addressing conditions that may cause TIA closely , such as hypertension, high cholesterol, and diabetes. Avoid illegal drugs, such as cocaine and so on in order to avoid the risk of TIA or other chronic diseases. 0 Response to "What Is Transient Ischaemic Attacks?"